“Anti-hate education should be increased from an early age, and anti-Semitic messages should be monitored in social networks,” said Israeli Ambassador to the United Nations Danny Danon. Israeli Ambassador to the United Nations Danny Danon meets with 28 European Union U.N. ambassadors in New York to discuss the intensification of of anti-Semitism in Europe, March 19, 2019. 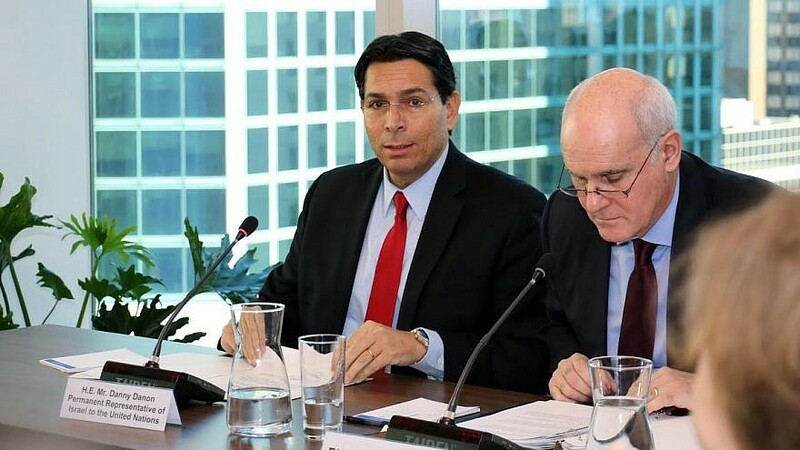 Courtesy: Mission of Israel to the U.N.
(March 20, 2019 / JNS) Amid the rise of anti-Semitism in Europe and the rest of the world, Israeli Ambassador to the United Nations Danny Danon met in New York City on Tuesday with ambassadors from the European Union and called on them to combat Jew-hatred. “The fight against anti-Semitism is a struggle for the very future of Europe,” he said.